We’ve now (finally) gotten all of the bills from Daughter Person’s surgery and followup. Total damage: $2,562.97, not including the first two appointments with the specialist to determine and confirm she’ll be getting tubes (those two together were $508.90 out of our pocket) – those were in the health insurance’s estimated cost of $2600. She’ll also be having followups every 6 months until the tubes fall out on their own, or we have to pay for another surgery to have them removed. The first 6 month followup will be in December 2015, and will include a hearing test, so it’ll be approximately $400 (based on the previous appointment she had with a hearing test). Despite having a high deductible, we still get the “benefits” of the health plan negotiations with the doctor and hospital – not sure it’s really worth the premiums we’re paying, if you pay cash and negotiate yourself, you can probably get similar “discounts”. Below, you’ll see what the “actual” charge was, and then what we have to pay. The charges from top to bottom in the image are: the 3 week followup appointment with the ENT, the hospital, the anesthesiologist, and the surgeon/doctor’s fee for surgery. This is the first full year we’ve had a high deductible plan, and this will likely be a year that we meet our deductible. Dad has some elective outpatient surgery he needs to take care of, so he’s scheduling that this year. I’m making sure that any outstanding medical issues we’ve been putting off are being taken care of this year because we’re so close to the deductible. We have over 4k in our HSA, but at this point, I’m just paying with my cash back card and adding up the amounts I’ll be able to withdraw in the future. The best part (not really): the surgery may have not been necessary. When they did it, they didn’t find any fluid behind her ear drums. So, we paid almost 3k to prevent ear infections that could be resolved with a $54 doctor visit and $4 in antibiotics. That’s over 40 ear infections. I get that doctors are cautious with kids and so on, but I’m still rather pissed about it – *he* didn’t pay 3k for basically nothing (granted, he didn’t get most of the money from it either). 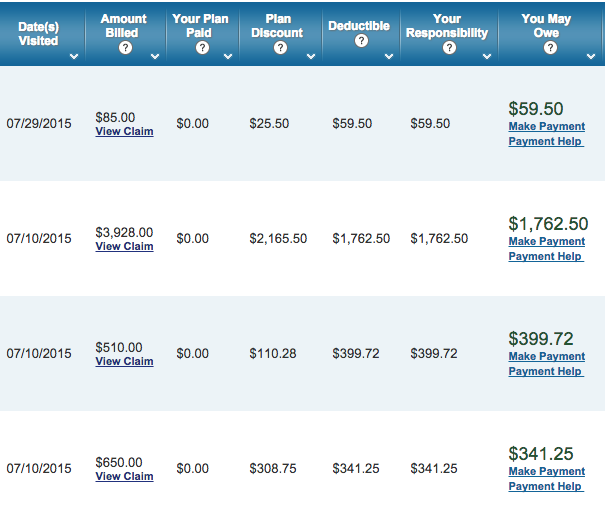 Do you have a high deductible plan? How do you handle “major” medical issues with it? This entry was posted in Finances, Health on August 11, 2015 by Mom.